As we saw in part 1 of my series documenting the computers i grew up with, the ZX-80 was fine but i didn't do a great deal with it. I needed something with a bit more oomph in order to fully be able to explore the world of computing and be able to properly interact with this exciting new paradigm... in other words i needed something that could play decent computer games. So our second microcomputer was the Commodore VIC-20. Technology wise it was quite a leap from the Sinclair, having a whole 5K of RAM (which was later expanded to a mind-boggling 16K!) and more importantly it had colour! It also had a proper keyboard as opposed to the awful membrane keyboard on the Sinclair. Software was loaded from a special Commodore cassette player (same as with the Sinclair) though there was also an extension socket to load games and other software from cartridges. We later added an extension board so you could load multiple cardridges. I had a few games on cartridge and my Dad tried his hand at a bit of assembly language programming (you can see the cartridge for that in the photo below, its the black one by the joystick. The cartridge loaded in the VIC is the RAM expansion one). 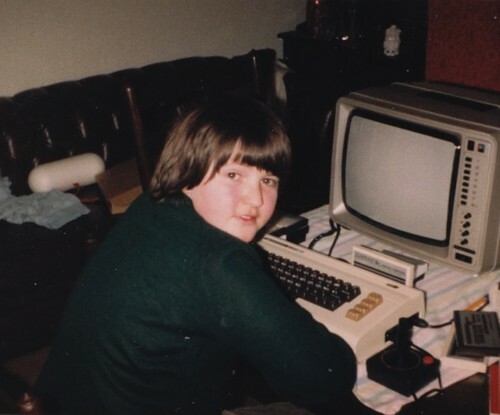 Actually my Dad was a keen programmer back in the 8-bit days but i don't think thats why i became a programmer myself later on, it is just because its one of the few things i am any good at. Me on the VIC in 1983, see the cartridges and other paraphernalia. The VIC-20 gave us several years of trouble free and largely enjoyable computing and for me that meant a lot of gaming. I can remember some of the games i played on it, vaguely, though not their names. My favourite was one where you flew a Harrier jump jet and had to shoot down MiGs, though running out of fuel was always a problem and when you landed for refuelling the MiGs would always come out of nowhere and blow you up! I used to play videogames quite a lot back then, not that i have ever been any good at them.